TOWARDS ZERO WASTE BUILDINGS. Strategies and tools for construction and demolition waste prevention and upcycling, which is featuring my photographs about SuperUse Studio’s work. by phd. architect Paola Altamura. 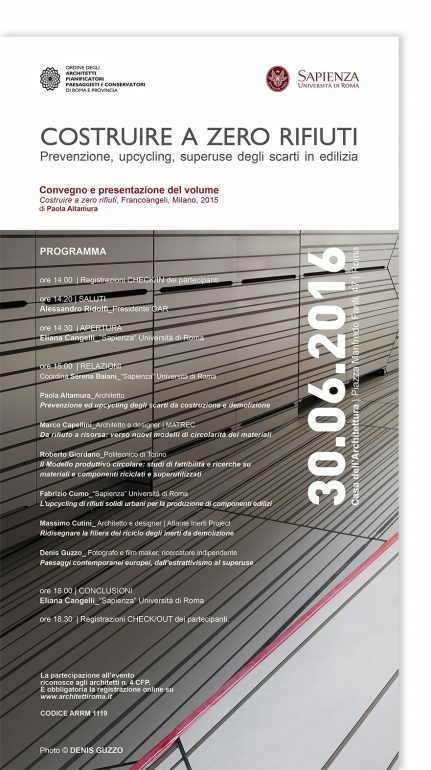 I have been invited by La Sapienza University and the Architects Board of Rome to share my experiences and views on the themes of SuperUse and urban and landscape policies. The seminar aims to open a discussion on how it is possible to develop strategies to shortcut material’s flows and prevent waste production in architecture through new design processes and mapping. A new concrete building in our cities means a piece of a mountain that has desapeared somewhere else. Recycling raw materials and implementing both awarness and practices are fundamental keys to reduce urbanizazion ‘s impact. My presentation entitled: Contemporary European landscapes, from estractivism to SuperUse illustrates a cross-section trough my projects that connects the state of the landscapes in relation with material’s flows trough urban development and architectural design.